Theories and research suggest and been proven that without giving out praise and recognition to employees are one of the main reasons they leave certain companies and organizations. Though increasing salary and adding bonuses are already important motivators, companies must also recognize employees’ achievement for the company at least once or twice a year. You can do this in different ways. Events and celebrations showcasing and awarding achievement of employees or teams are one way to do it or give added rewards for their achievement. Leadership and motivation works and comes together when it comes to handling employees. As mentioned Chapter 1: Focus on the Bigger Picture, motivation isn’t something that can easily obtain without proper leadership since it is essential to an understanding of motivation. Peter Drucker said that leadership is that quality of examining work to ensure that effort is not placed where there are no results. According to this definition, leadership is the skill of establishing priorities and marshaling resources to achieve worthwhile goals. While some may disagree with this definition, few will argue that Drucker's view is unreasonable. Supervisors have the difficult and primary task of determining what is important in their organization. Drucker advises them to forget about yesterday's services, to maintain today's breadwinners and, as managers, to emphasize and nurture tomorrow's objectives. Indeed, a fundamental rule of leadership is to delegate yesterday and undertake tomorrow. Those expensive experiences in management ego, in developing and maintaining services and collections long after analysts have revealed their failure, must be avoided. Leadership is the art of recognizing the mistake, even one's own, and correcting it before it bleeds the institution. Leaders today must learn and master new skills adding up to the traditional leadership methods to lead their teams and employees into the success of the company. 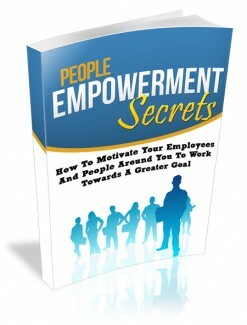 Continuously mentioned in this eBook is that motivating employees is imperative and thus a skill any leaders must acquire. It can be quite costly but with the right usage of tools can be advantageous for all and most organizations. Leaders must employ these tools and resources properly to achieve their goals. When it comes to motivating employees, one leadership trait to have is the ability to infuse inspiration to each member/staff or employees. Besides sharing ones' vision and directions, asking for opinions and ideas is a great way to build trust and relationship as well as inspire each other. It can be called as "successful leadership relationship" and must be effortless when it comes to inspiring employees. Following an effective leader, people accomplish and achieve more than they may ever have possibly dreamed. The foundation of this successful relationship is the leader’s ability to make people feel important. So, effective leaders need to demonstrate these practices. Pay attention to people using common courtesy. Simply saying "Good Morning" or replying to each courtesy will inflict positive feedback. Asking how their weekend was or their family is a powerful simple tool to practice to in order to build relationships toward your people. Listen to your people. Rather than leading and them listening only to you, the leader, start listening to your employees/staff or members and give full attention when needed. Set meetings to listen to their needs better. Moreover, you can hear more of their ideas and opinions regarding the organization and oversee which and what is working for their comfort. You make people feel special when you listen to them without distraction. Put praise in writing. A "thank you" note to the employee, with a copy to her file, magnifies the impact of the recognition. Keep true to commitments. Make sure never to cancel except in a true emergency. Promising raise or bonus? Never fail it. Do not keep promises or commitments you can't meet. Give credit to employee contribution. Remember suggestion boxes and meetings? When a great idea is presented, make or suggested it. When fulfilling responsibilities as a leader, it is quite obvious that most are no longer willing or motivated to work. This is not necessarily either good or bad. Employing cheap and willing labor is no longer easy like what most companies are used to. Even employing student labor isn't as many as before and commonly most students are no longer willing to work extra and do mundane work such as categorizing and shelving files and books. They will work, but prefer to do so in areas where they can gain useful experience for their own careers. "Too often the solution seems to be a higher salary, but this is not necessarily so." Most people and even companies’ think that money is already a good motivator for employees to stay in their companies most simply pretends but if you change the reward, you can change people's behavior. Some researchers argue that to motivate employees you should be able to give them happiness. However, Duke Psychology Professor Dan Ariely argues that both happiness and money are both motivators and simply categorizing them based on money and happiness will oversimplify things and miss out the important factors on what motivates people. Many people think that, in the end, motivation is all about money, for all that people pretend otherwise. If you change the reward, you can change people's behavior. Others argue that it's all about finding happiness. Duke psychology professor Dan Ariely argues that both play a part but that those explanations wildly oversimplify things, and miss out on what truly motivates people.